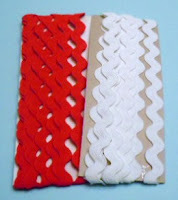 Here is another RICKRACK CRAFT easy enough for kids to make! 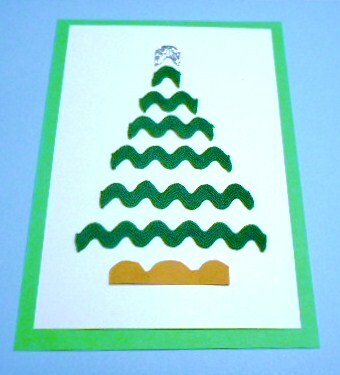 This activity is a fun, inexpensive CHRISTMAS TREE Card! 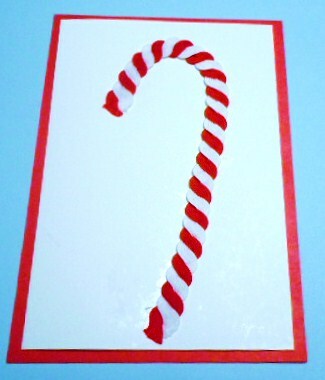 My previous post was a Rickrack Candy Cane. You can view it here. Cut a rectangle from cardstock and fold in half. Glue the pieces on the front of the card in the shape of a tree.The smallest section goes on top and the largest goes on the bottom. Add a tree topper, if desired. (I used a small piece of silver rickrack). 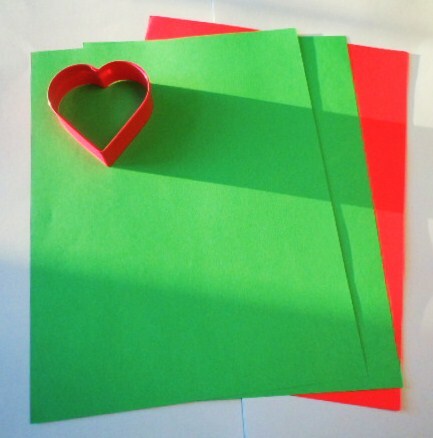 Write a holiday greeting inside the card! Give or send the card to someone special! The kids might enjoy listening to Christmas music while constructing their trees and reading a Christmas story while their cards dry. If you would like to view a Rickrack Wreath click here. Here's a fun activity, I found in Martha Stewart Living Magazine's Holiday Handbook. 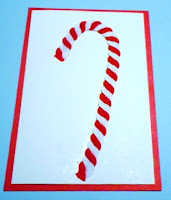 The cute candy cane is made with red and white rickrack and can be used on a homemade holiday card or smaller versions can be used on homemade gift tags. Cut 2 pieces of rickrack the same size (1 red + 1 white). 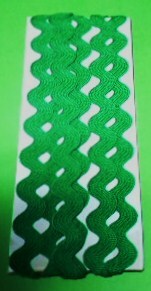 Twist the 2 strands together to make one striped piece. 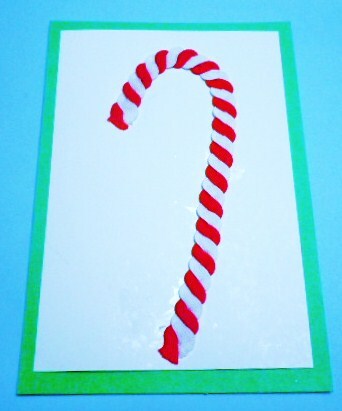 Glue the new striped piece on the front of the card in the shape of a candy cane. Click here to view a rickrack tree! Click here to view a rickrack wreath. This clever, fun, inexpensive craft activity comes from Family Fun Magazine. 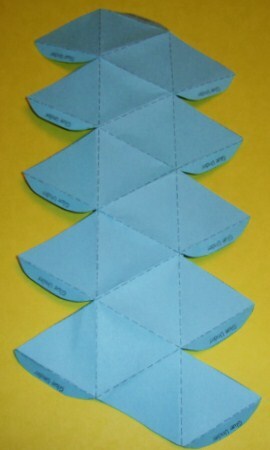 Arrange cotton swabs into a geometric shape on a piece of wax paper. Squeeze a little tacky glue on all the areas where the ends of the swabs meet. Shake some glitter glue into each spot where the glue was squeezed. Allow the snowflake to dry overnight. 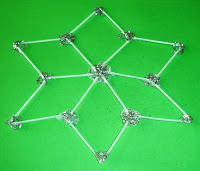 Display your snowflake by hanging in a window, on a bulletin board, etc. 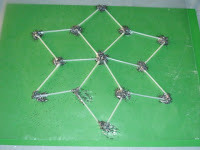 This activity would tie in great with a math lesson on rotational symmetry or a science lesson on weather/precipitation. It would also be a good activity to do on a snowy day along with reading books and singing songs about winter and snow. 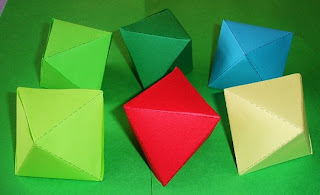 Younger kids will enjoy making cubes while older students will enjoy making dodecahedrons and icosahedrons. Here are links to 2 great websites to download NETS (2 dimensional representations of 3D shapes). 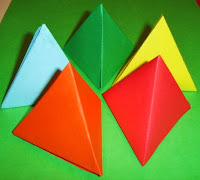 Students can color or decorate the NETS then cut, fold, and glue the shapes to make lots of fun 3D shapes. 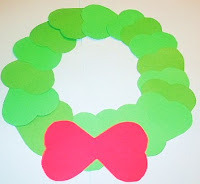 These shapes can be used to make Holiday Ornaments in December or as fun, colorful decorations in windows, on mantles, on bulletin boards, etc. any time of year. Have fun constructing 3 Dimensional Shapes. 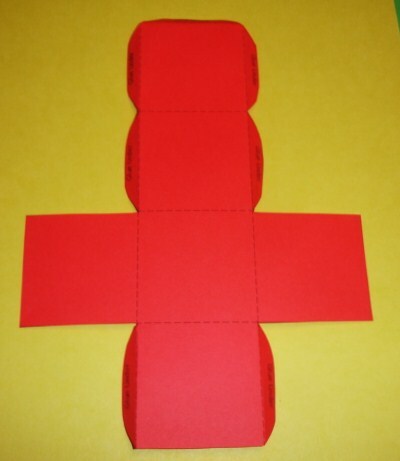 Here's a fun way to combine Math with an easy Holiday Craft Activity. Octahedrons are 3D shapes with 8 sides. All the sides are triangles! You can download an Octahedron model (NET) from the Math is Fun Website. Click on the link below. You can use any paper that works in a printer to print the models. Students can decorate the 2D Shape (NET), if desired. 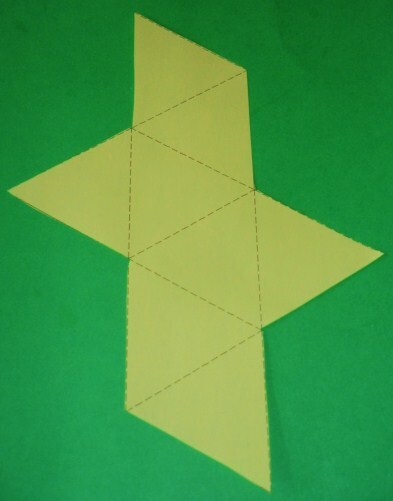 Then they will need to cut, fold, and glue the 2D paper shape to make a 3D Figure. These 3D Shaped Octahedrons can be used as colorful holiday ornaments or as decorations any time of year. They can be hung in windows, from the ceiling, on a mobile, on a tree, etc. Have fun combining geometry and crafts! 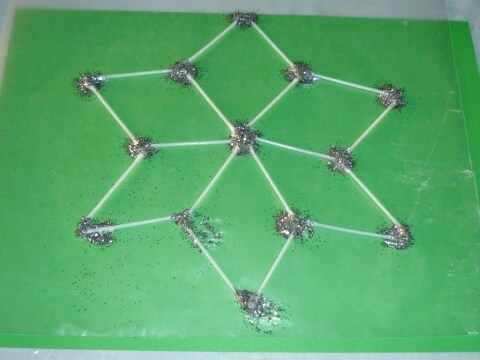 Here's a way to combine Geometry and a Holiday Craft Activity. Tetrahedrons are 3D shapes made with 4 triangles. 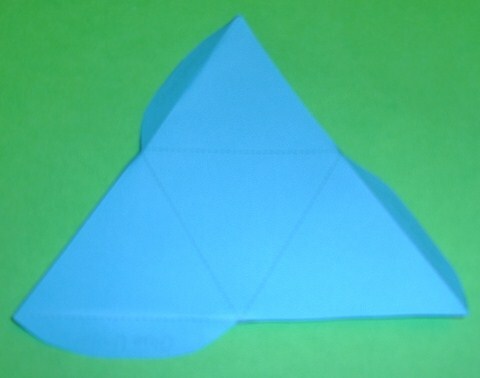 You can download a tetrahedron model from the Math is Fun Website. Click on the link below. You can use white or different colors of paper to print the models. 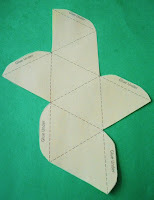 Students can decorate the 2D Shape (also called a NET), if desired. Then they need to cut, fold, and glue their 2D paper shape to make a 3D Figure. 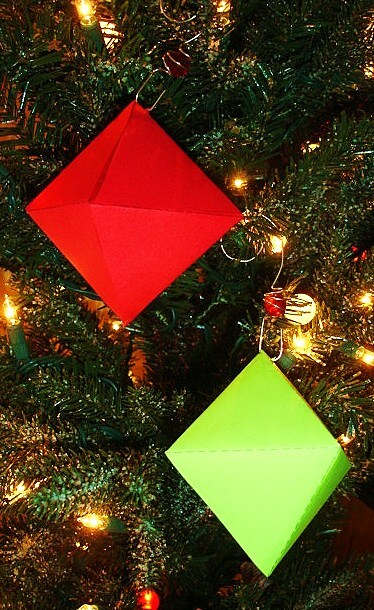 These Tetrahedrons can be used as colorful holiday ornaments or as decorations any time of year. They can be hung on a tree, in windows, from the ceiling, on a mobile, etc. Have fun with math and crafts! I have been nominated by Miss Moe at http://missmoe-thesearethedaysofmylife.blogspot.com/ for the Versatile Blogger Award. 1. Link back to the blogger who nominated me. #1 I'm addicted to coffee! I can't start my day without it. #3 We are big sports fans..... Love our Red Sox, Bruins, Celtics, and Patriots! #4 We bought a new house 3 years ago. We have coyotes traveling not just in our neighborhood but also through our yard! I have pictures of a coyote 5 feet from my deck! Yikes! #6 I grew up and always lived in the city so all this wildlife is new to me! Now for my nominations ... in no particular order ... all are fabulous!!!! This is only a partial list of all the bloggers I respect and admire. I wish I could pick more for this post! We buy some of these beautiful flowers every year at Christmas. Poinsettia Plants are native to Mexico. There are over 100 varieties. They come in red, orange, cream, and white. While shopping with my husband at his favorite store, Home Depot, I noticed some beautifully shaped paint color swatches . The more I looked at them, the more they reminded me of the petals of a Poinsettia Plant. 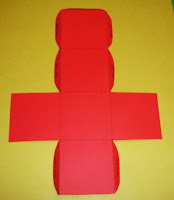 That's what is used in this craft activity, although you could use any type of paper or card stock. If you are using paint swatches, gather 5 of them and form a circle. 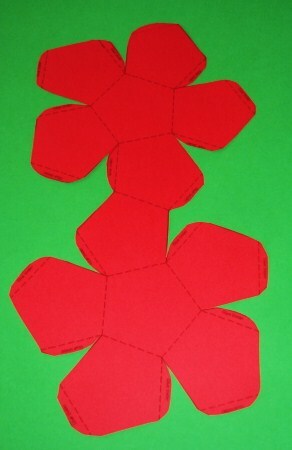 If using construction paper, draw and cut 5 red petals, then form a circle. 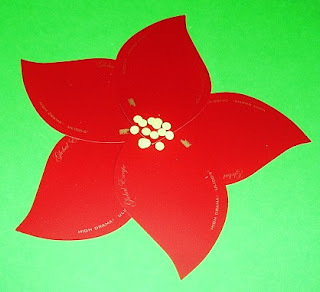 Glue the petals together where they overlap. Use a paper punch to make some small yellow circles. Glue the yellow dots in the center. In doing research for this activity, I learned that the red, pink, etc. parts of the plant are not the flower. They are actually colored bracts (modified leaves). The small yellow clusters in the middle are the actual flower part of the plant! These paper flowers could be used as a craft for the front of a homemade Christmas Card although they are quite large (about 8 inches in diameter). 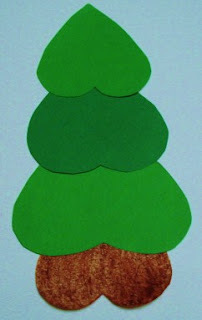 They could also be used as a holiday decoration on a door, window, bulletin board, tree, etc. A great book for kids to read to go along with this craft is Tomie DePaola's The Legend of the Poinsettia. 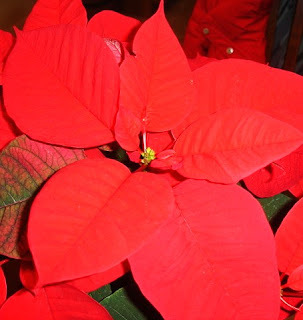 Another Poinsettia Craft can be found here. 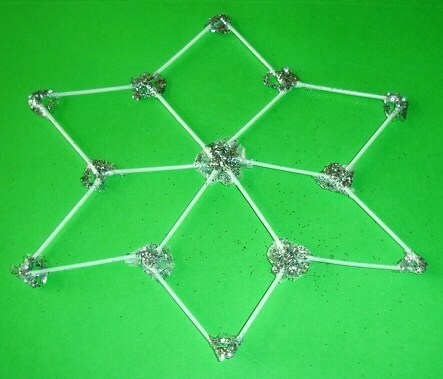 This simple, fun activity for kids teaches concepts in Math and Science. Remove the labels from 2 clean, clear, plastic bottles. Have an adult remove any plastic rings that are on the necks of the bottles. Fill one of the bottles half full of sand. Screw one end of the tornado tube connector onto the bottle filled with sand. Screw the other bottle onto the other end of the tornado tube connector. Turn the bottles over to watch the sand flow into the other bottle. 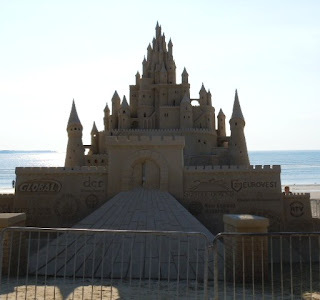 Use a timer/stopwatch/clock with second hand to time how long it takes for the sand to completely flow. Older students can try to make a timer that is exactly 30 seconds or 1 minute. They can use the timer for various fun tasks. If you don't have the availability of a tornado tube connector, the kids could use a round piece of cardstock or heavy aluminum foil, the same size as the mouth of the bottles, with a hole punched in the center. Place the cardstock between the bottle openings and tape the bottles together. The tornado tube connector works the best but the tape can be used as an alternative. Have fun with your 'Time in a Bottle'! 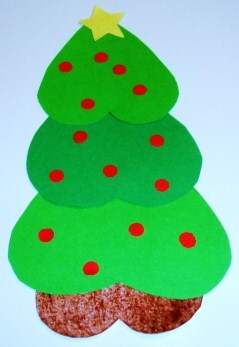 This paper Christmas Tree is a very easy and inexpensive craft activity for kids to make. It is made with 4 heart shapes. 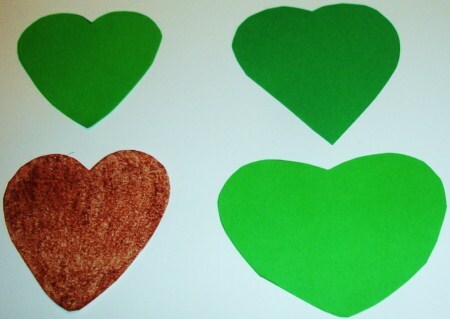 Trace and cut 3 green heart shapes (small, medium, large). Trace and cut 1 brown heart shape (small). Turn the hearts upside down. Place the small brown heart on the bottom. That will be the tree truck. Place all 3 green hearts above the brown heart. Have the smallest green heart on top. Overlap the hearts. 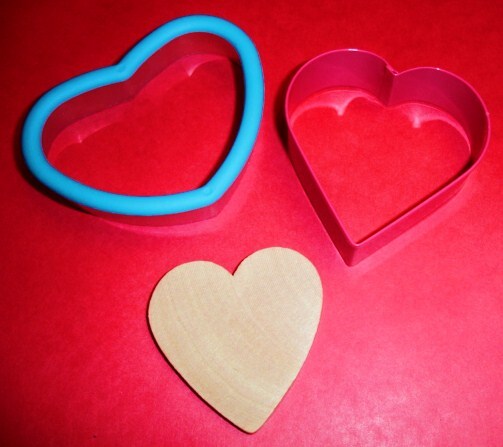 Glue the 4 hearts together. Finally decorate your tree. Have fun! There are lots of great books for kids to read about Christmas and Christmas trees to go along with this craft activity. Below is a sampling from Amazon. 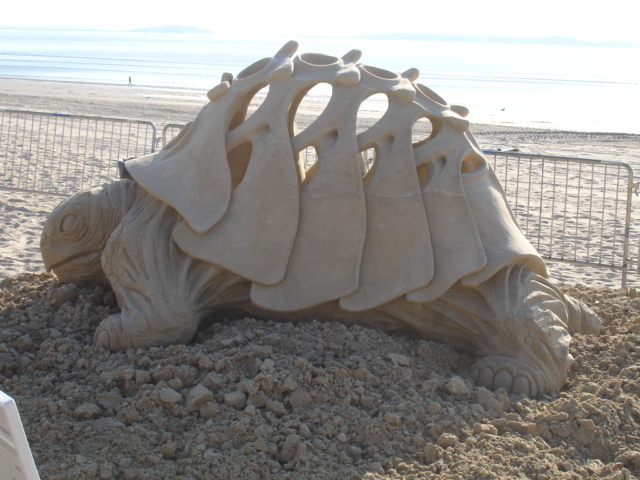 Sand Art is a fun craft activity for very young kids all the way up to adults. Here is a simple activity that even preschoolers can enjoy. 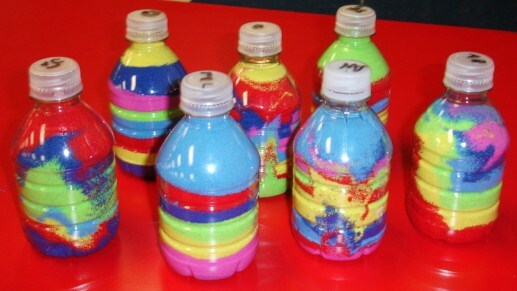 These sand art bottles were made by students in PreSchool - Grade 2. Remove the label from an empty clean water bottle. Allow time for the inside of the bottle to dry completely. Put each color of sand in a separate plastic cup. 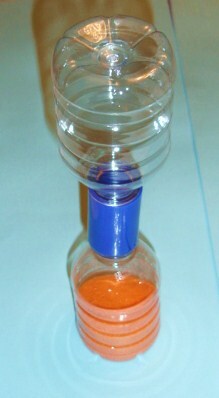 Place the funnel inside the water bottle. Have the child choose the color of sand that they want on the bottom of the bottle. Have the child slowly and carefully pour some sand into the bottle. 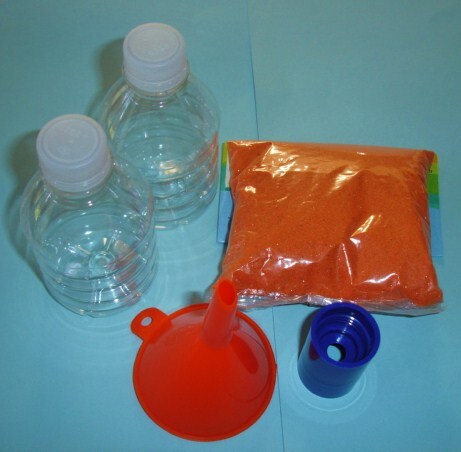 Have the child continue to choose a color and pour some sand into the bottle. When the bottle is almost full the child can add a ripple effect by carefully using a coffee stirrer, thin straw, or the handle of a spoon. They can slide the coffee stirrer/ etc. along the inside edge of the bottle and then bring it back up to make small ripple effects. The child can also very, very slowly and carefully tilt the bottle to slightly shift the sand layers. Finish up by adding sand up to the rim and placing the cap on tightly. Older students can try to make a more sophisticated design with their bottles. This activity can be tied in with a Science Unit on Rocks and Minerals since sand is really rocks broken down into very small pieces. If you are working with older students, I have a Rocks and Minerals Word Search Puzzle on my website. You can download and print the Word Search from my Free Worksheets page. 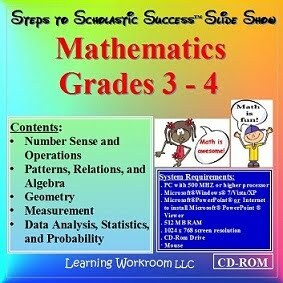 Click on the link below, then click on Free Worksheets. 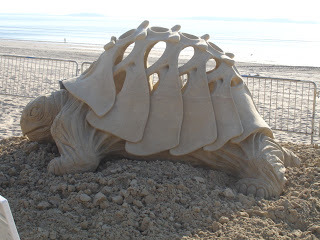 Now, I'd like to share with you some absolutely incredible Sand Art pictures that I took this past summer. Revere Beach in Massachusetts is the oldest public beach in the United States. Each year they hold a Sand Art Competition. Contestants come from all over the world. Big crowds fill the beach. My husband and I drove down at 5:00 AM on a Sunday morning to see all the entries before the crowds arrived! My favorite although they were all so awesome!!! 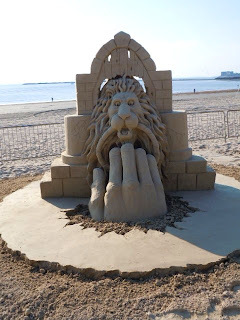 Have fun with Sand Art! Here is a real easy and inexpensive wreath for kids to make. Very few supplies are needed. This arts and crafts activity is made entirely of heart shapes! 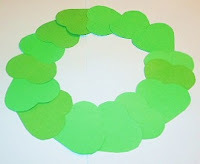 Form a circle with the green hearts to make the wreath. Glue the 15 green hearts together. Use the 2 red hearts to form a bow at the bottom of the wreath. 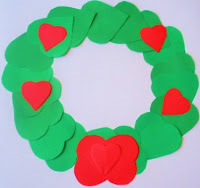 Glue the 2 red hearts onto the wreath. Trace or draw approximately 5 smaller red hearts. 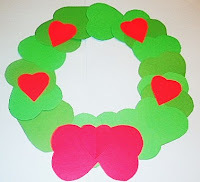 Use these smaller hearts to decorate the wreath and add a 'knot' to the middle of the bow. Glue the small red hearts on the wreath.